Sharing one account to run and control SMS campaigns with co-workers doesn’t have to mean having one login and password for all, without knowing who made what and where did all bought credits go. Our Web Interface allows you to set sub-accounts, that can execute campaigns sharing one credits balance. Having unlimited sub-users you can add, with various accessibility and administration permission levels you can easily manage – who send what to whom or check history of activities. You simply have control over everything that happens on your main account. Simple and easy. Full access – account has full access to numbers in selected groups (edit, send and delete). Sender name access – subuser will be able to use selected sender names for sending SMS. We did our best to make uploading contact list as easy as possible – do it in the way you find most convenient, prepare spreadsheet in *.xls or CSV format, simply upload it through our Phonebook feature in Web Interface (or API) and you can start sending campaigns. Web Interface is equipped with powerful Phonebook, that you can use not only to upload contact to, but it’s also prepared for advanced management. You can create and prepare predefined groups of recipients, to properly target your future SMS campaigns. Contacts database segmentation allows you to create SMS campaigns closely matched to needs of specific target group. Thanks to this you’ll be able to increase your campaigns effectiveness, simultaneously achieve costs reduction of executed campaigns. It’s good to make some extra effort and while building or importing contact database add additional personal information, such as Name, Last name etc. and use them in your SMS communication. Try it and find out how it will increase recipient’s engagement – we all love to be treated personally, especially when it comes to such personal communication channel like SMS texts. 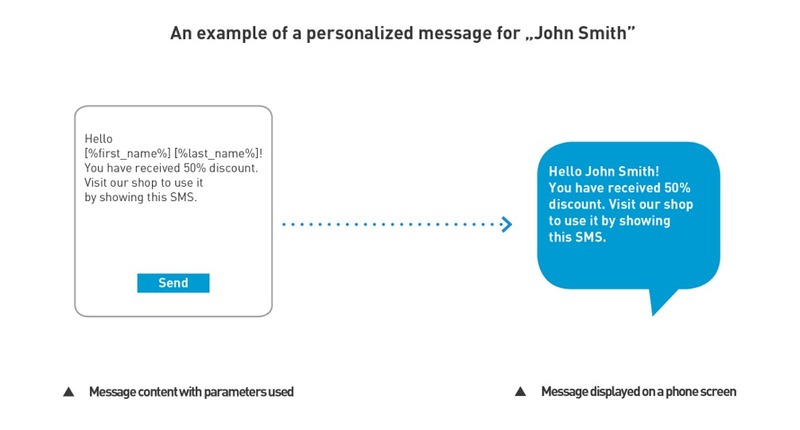 To use SMS Personalization feature, e.g. name, all you need to do is put [%first_name%] and it will be automatically replaced. Full list of commands is available under this link. Just when you thought that this is all this feature has to offer we have something special, that will help you avoiding texts where name of a recipient starts with lowercase – if you’re not sure whether all names in your database start with capital letter, simply enter [%first_name:capital%] and our system will make sure that all names in send campaign will start with capital letter. Thanks to this if you have any “michael” or “jane” in your database – their names will be converted into “Michael” and “Jane”. As you can see – we got you covered even in such matter. If you have 160 characters, but a message that requires much more than that – don’t worry. Today mobile phones can handle longer SMS text and how it to its receiver as one message. Our platform is prepared to send up to 918 characters long SMS (6 parts SMS). You can use it to send more detailed information or notification or insert special characters in UTF-8 coding (using this type decreases number of characters from 160 to 70 signs per message). Being able to plan your campaigns ahead is great advantage and time-saver. We value your time as much as you do, that’s why you can schedule your SMS messages – define sending date and we’ll deliver your messages exactly when you want to. Log in to your account and click Recommendation system in Quick navigation bar. Read terms and conditions and accept them, to activate affiliate program on your account. Note down your unique recommendation code and link, to distribute it among companies you want to recommend Gretor SMS platform to. In Gretor SMS we strongly believe, that our customers are the ones that can share their Gretor SMS positive experience with others. There’s no better recommendation than a satisfied client. 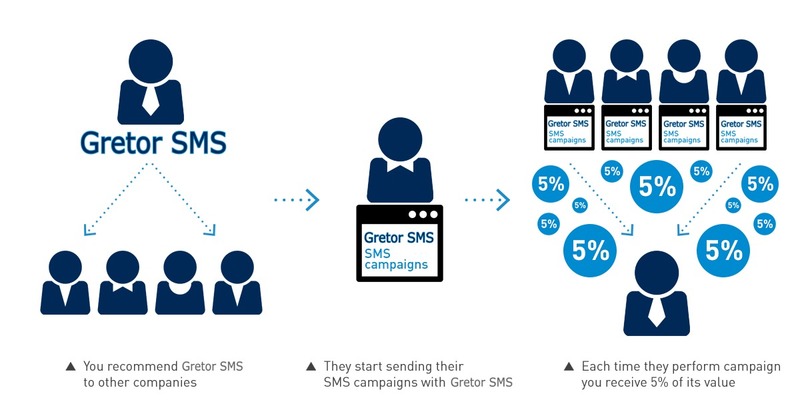 That’s why in order to show our appreciation for each registered and active company that you’ve recommended Gretor SMS to, we’ll give you special bonus – 5% value of each SMS campaign they will perform. you cannot use recommendation code while creating another account for your own company or its branch. Log in to your account and join our recommendation system today! 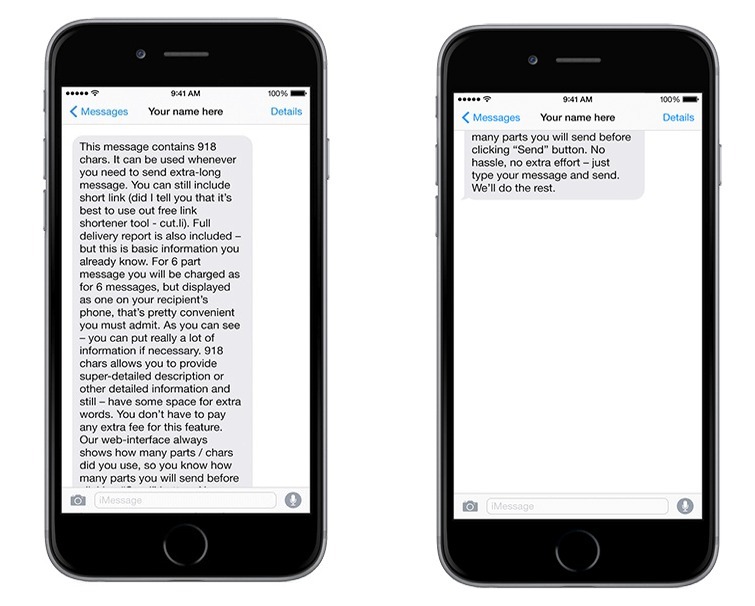 Are you frequently sending the same or very similar SMS messages? Of course you can keep prepared texts in notepad or in any other kind of file you feel comfortable with. But why bother if we can offer you much more convenient way – message templates. All you need to do is predefine message texts in our user friendly Web Interface and use them anytime situation will require that. When it comes to running business, especially on the Internet, it’s essential to keep your site running 24/7. Although most hosting services are reliable, you cannot totally avoid all kinds of failure and it’s better to be informed if such thing happens, right? If you’re seeking for service that notices you if your website is down, we’ve got something for you – Webmonitor SMS. A service that checks if your website works properly. It all starts with adding up to 5 URL addresses you want to be monitored. Added URL is checked with 5-30 minutes interval and if URL will be not reachable, you will get SMS notification to number that you specified in settings. Cost of received SMS notification depends on the network to which SMS message is sent and will be charged from your account.